Stephanie has been with Redkey Veterinary Clinic for fifteen years. You can find her smiling in the groom room with hair flying every where! The best part of her job is working with the animals and making new friendships. Stephanie has been married to her husband, Brad, for twenty six years! Their son Brandon and his fiancé have a daughter, McKynlee(2 1/2yrs). Stephanie and Brad also have a 18 year old daughter, Kami. Stephanie's hobbies include being band and guard mom, going to dog shows, being a 4H Dog leader, and scrapbooking. Stephanie and her husband have six dogs: Rose, Australian Shepherd, age 9; Banks, Australian Shepherd, age 9; Ice, Australian Shepherd, age 8; Skittles , Australian Shepherd, age 7; Gabe, Red Bone, age 4; and Wizard, Australian Shepherd, a year old. They also have a domestic short hair cat named Romeo of 14 years of age. Lise has been with Redkey Veterinary Clinic for twenty five years. She can be found in any number of positions around the clinic, among her favorite-assisting in surgery. She enjoys all aspects of her job but going on farm calls and working with horses always puts a smile on her face. Lise has been married to her husband, Dave, for 39 years! Their daughter, Andrea and her fiance Justin have a son, Rowdy(8). Their son, Josh and fiance Lori have two sons, Dyllan and Landon and a daughter, Rook(7). Lise's hobbies include anything that has to do with horses, camping, motorcycles and 4-wheeling. Being outside, in the sun really makes Lise happy. Lise and Dave have one horse- Bubba, a thirteen year old Appaloosa. They also have three inside dogs, Otis-a 9 month old beagle, Millie-an 11 month old Black Lab, and Scooby the 14 year old dachshund. 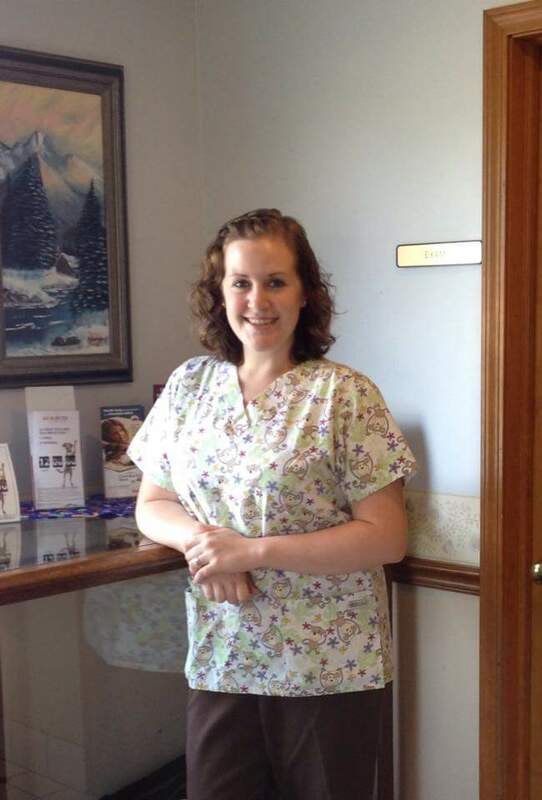 Rachel has been with the Redkey Veterinary Clinic for nine years. She can be found doing any number of jobs around the clinic, always with a smile or laugh. Her joy for the job can be attributed to a number of things- She loves the relationships that she has formed with the clients and the animals. She loves working with the animals-all shapes and sizes. She gets her passion for the clinic honestly, considering both her parents and brother are the veterinarians at Redkey Veterinary Clinic! Rachel has been married to her husband, Adam, for seven years. Together they have two boys, Ryan(3 1/2 years) and Caleb (15 months). Rachel's hobbies include music, photography and sports. Rachel and her family have one dog, Kane(Doberman)-age 3, and a cat, Hank(Domestic Medium Hair)-age 10. Rachel graduated from Shekinah Christian School in 2006. She earned a degree in photography from the New York Institute of Photography in 2009. Michelle has been with the Redkey Veterinary Clinic since November 2015. She comes with a degree in Veterinary Technician from Brown Mackie College-October 2015. Growing up with animals herself, Michelle fell in love with animals and wanted to do more! Her passion is helping people by helping their animals. Michelle has been married to Brandon for 5 years. They have a son, Brayden-6 years old and a daughter, Rachel-2 years old. When not working or chasing down kids, Michelle finds herself reading a good book. Michelle was a 2007 graduate of Jay County High School. Adding to their family are 3 dogs, Maggie-a 2 year old Husky, Bugsy-a 4 year old Pomeranian and Purity-an 8 year old Pitbull. Also one cat, Tiger-a 2 year old Domestic Short Hair.